Reservations necessary; Pick up and drop off location from December 19 onwards is at the Burjuman Center, Ground Floor Main Entrance. You will receive a voucher once your booking is confirmed. Please present your voucher and your valid Dubai Pass to the staff at the Burjuman Center Sales office on the day of the tour. If no voucher and pass is provided then you will not be allowed to join the tour. Once a booking is made no cancellations or amendments will be accepted. Work Hours Please arrive no later than 2:15 PM. Tour leaves 3:00 PM sharp. Torn between a cultural tour around the coastline and a trip on the clear ocean waters? Why not combine the two activities into one and book up with a Wonder Bus tour with iVenture Card today! The Wonder Bus is a unique exploration which travels on land and in water. The adventure can be enjoyed by people of all ages, is an ideal way to see the city highlights without getting wet or stopping off for a hike in the heat. The Wonder Bus also serves free refreshments during the tour. Dubai’s most iconic bus adventure will introduce you to luxury attractions and places of interest such as: Jumeirah Mosque, Union Museum, Al Fahidi District, Al Hosn and Dubai Museum, Abra’s Station, Old Souq Bur Dubai, Heritage Village, Diving Village, Ruler Court, Dubai Municipality, Deira Old Souqs to name but a few. Get your camera at the ready as there will be plenty of opportunities to snap away and capture your big day out forever! Your expert guide will provide commentary to educate you about the attractions you’ll pass by and leave you with interesting tales about their history and the part they play in Dubai’s modern world. The bus has been designed to ensure comfortability with air-conditioning, and lavatories onboard. Your vehicle is also equipped with surround sound. Be sure to arrive 45 minutes before the trip departure time. Be aware that Wonder Bus has the right to alter or cancel trips at any time due to bad weather conditions or other emergencies. 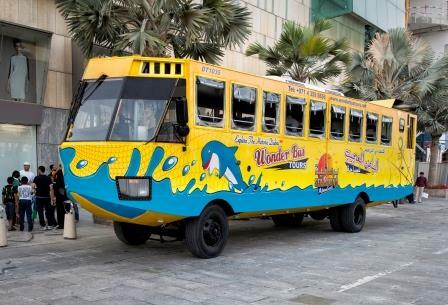 The Wonder Bus is located at the Burjuman Center along Khalid Bin Al Waleed Road. You can expect about a 20-minute drive by car or ride by taxi from Downtown Dubai. It will be about a 45-minute to an hour ride, if you are planning to get there by public transportation. Walking to the departure location of the Wonder Bus will take you about an hour walk from Downtown.